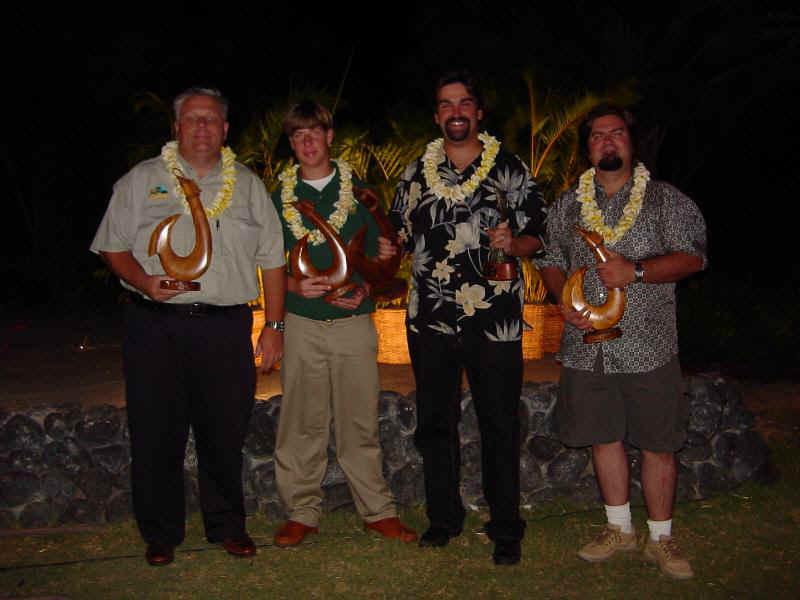 In August of 2005 Tommy & Thomas were part of The Outdoor Channels Buzzard Angling Team for the 46th Annual Hawaiian Billfish Tournament in Kona Hawaii. 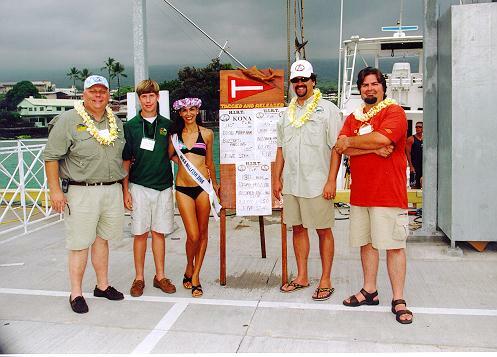 The tournament draws teams from all over the world competing for 5 days, fishing on a different boat each day. 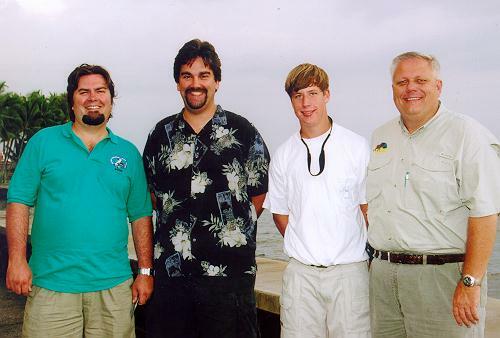 The Buzzard's (The team name is the founder of the Outdoor Channels nick name.) finished 3rd in the tournament and the following is a day by day account of the tournament. While competing in the tournament we were also part of the Outdoor Channel's 1 hour documentary that will appear on the Outdoor Channel in October. As we get more images we will be posting them to the site. 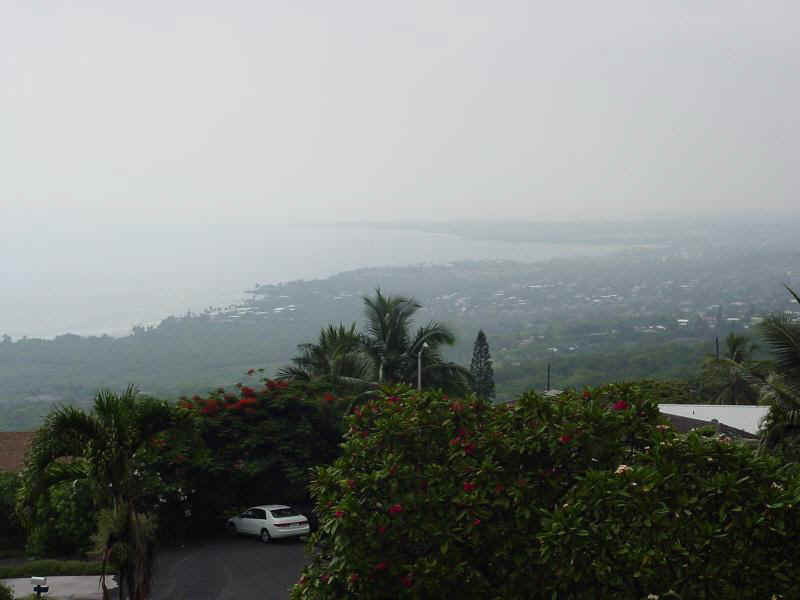 View from our house on the mountain overlooking the harbor. Team picture at openings ceremonies at Hulihe'e Palace. 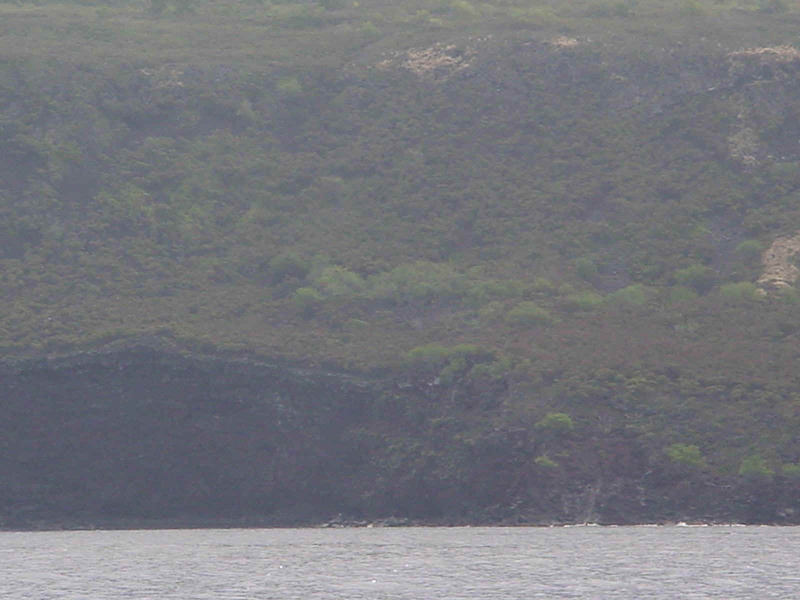 This shot gives you an idea of how close to shore we were fishing. 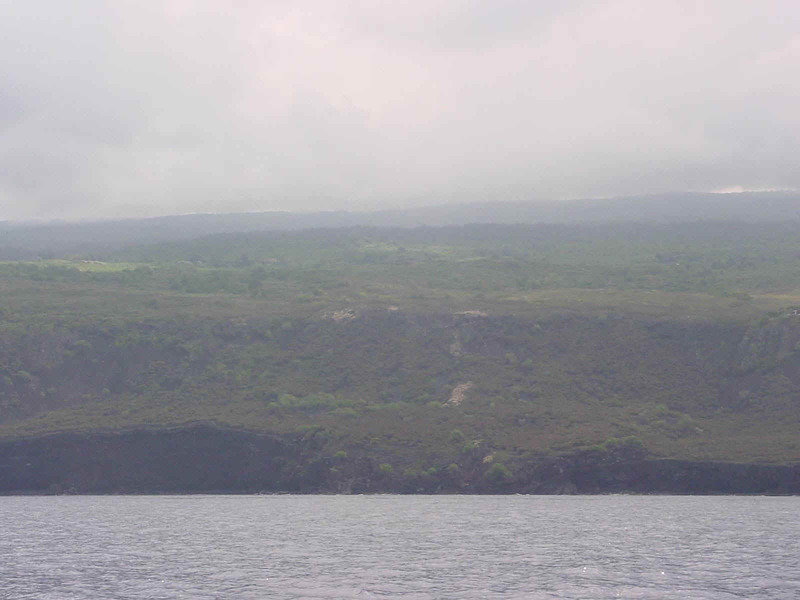 We were fishing onthe backside of the volcanoe and the pictures truly don't do justice. Monday, First Day of Fishing: The action came early in our first day of the HIBT with a strike as we were putting the lines out. It was more of a swat but it had everyone's attention. 30 minutes later another strike, Thomas was the designated angler and he got as far as the fighting chair with the rod before he pulled the hook. It looked like it was going to be one of those days. We fished all day without another strike until there was less than an hour to go for the first day. Another strike more in the swat category knocked down an outrigger line. Thomas took the rod and started working the bait, dropping it back and reeling forward trying to tease the fish back into hitting the lure. 3,4,5 times no luck, the captain and I turned our back on Thomas to start back fishing while Thomas continued to work the bait behind the boat. No sooner had we turned our back the reel starting screaming as the blue marlin was taking line, Thomas was hooked up. Thomas made his way to the chair and the fight was on with video camera rolling for the Outdoor Channel. Captain Alan Bakke and his deck hand Sam Choy went to work maneuvering the boat and working the fish. How good are they in Kona? In less than 15 minutes the blue marlin was up to the double line but this fish was not a happy. He made a charge at the boat jumping over the right rear corner of the boat as Sam held the leader (We reviewed the raw camera footage last night and its pretty incredible) and brought him around for the tag. I tagged the fish and it made him even more unhappy, Sam was now really hanging on. He brought the blue back along side and he and the captain unhooked him and released him. Thomas was on the board the first day. With less than 30 minutes left in the fishing day we put the lines back out thinking we were done. 10 minutes later we hooked up again, but this marlin threw the hook on his first greyhound run. A great start to a week of fishing. On Tuesday we'll be on the Five Star, they tagged 3 blue marlins yesterday. 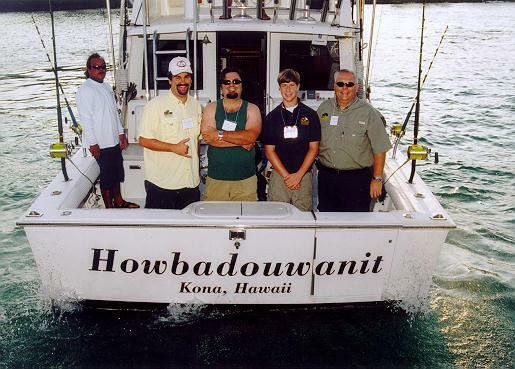 The boat we fished on Monday was named Howbaduwantit, it fit Thomas perfectly. 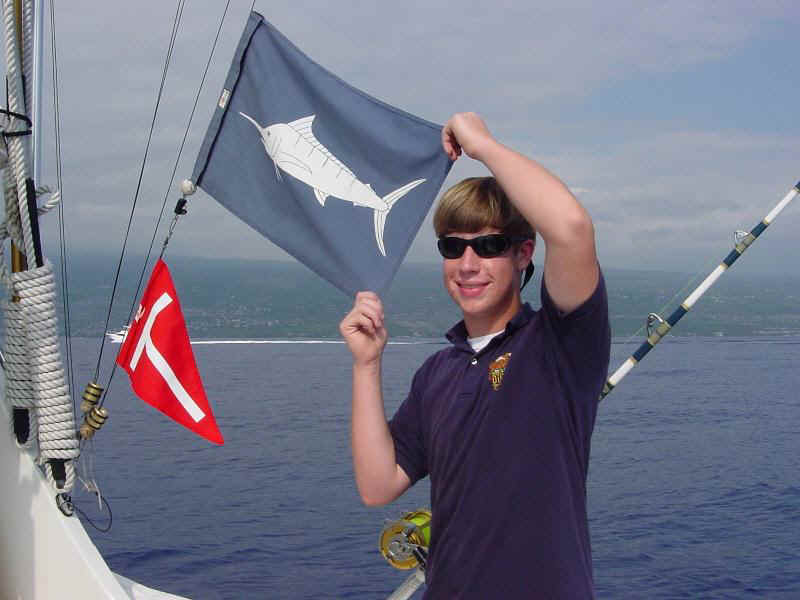 Thomas with first of what would become 3 tag flags on the week. 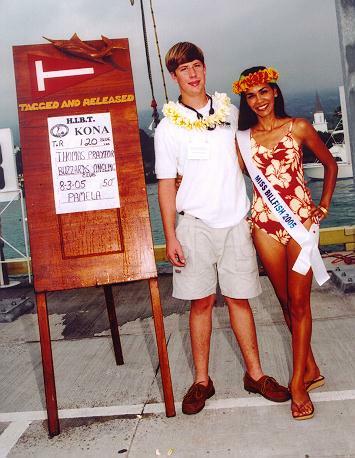 Thomas on the dock with Miss Billfish. This would become a familiar scene for the team during the week. Team photo with catch board for day 1. Tuesday, Second Day of Fishing: Our day started strong with our first Blue Marlin tagged and released in the first 30 minutes of fishing. While Thomas struck first yesterday it was Dads turn today to draw first blood. Wade Sherman hooked a spear fish and while we were bringing the rest of the lines in I hooked another blue marlin. My fish was short lived while Wade brought his to the boat for our second tagged fish of the day. The rest of the day was sprinkled with hits and misses as we raised 10 billfish today to go along with the 5 we had yesterday. As the rotation winded down we had an extra 45 minutes that was not spoken for without restarting the rotation. We decided to draw high card among the 4 team members with Brad Markham pulling an ace and earning himself the last 45 minutes in the chair. It looked like it was going to be for nothing until 3:55, 5 minutes left to fish for the day. A blue marlin crashed the long center rigger and the fight was on. 25 minutes later Captain Carlton Taniyama put the tag in him and Brad recorded his first ever blue marlin. We scored 700 points on day 2 raising our total to 1,000 points for the tournament. We came into today tied for 5th and today's action should move us up to 3rd. Once again the Outdoor Channel film crew caught the action and there is some really great video. 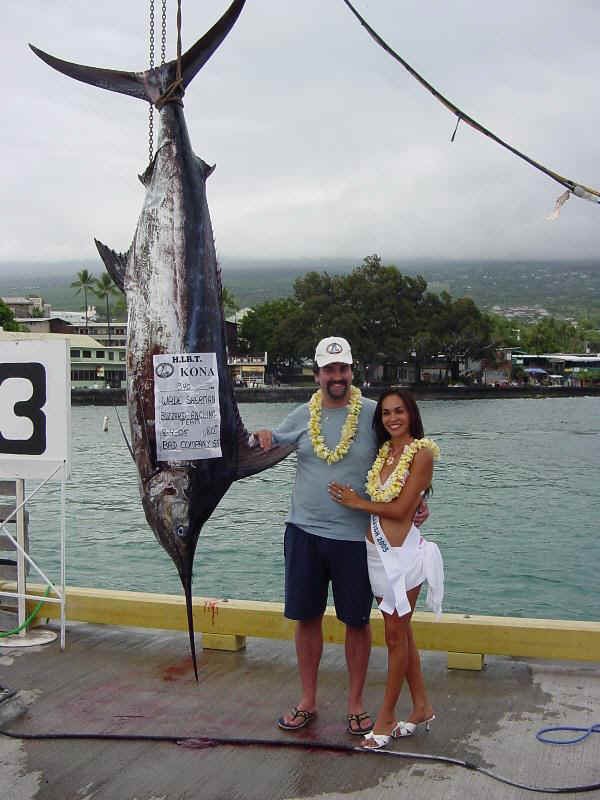 Wednesday we fish on Pamela, the captain is the current tournament leader and they caught the 562 pound blue on Monday. 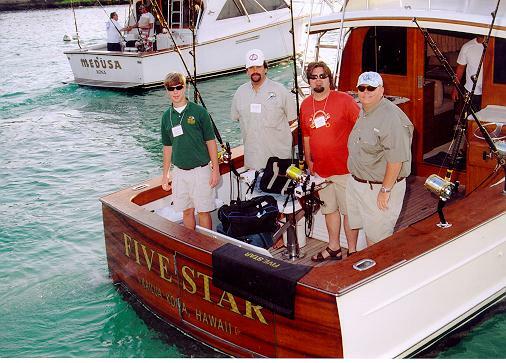 Team shot on Five Star leaving Kailua Pier. 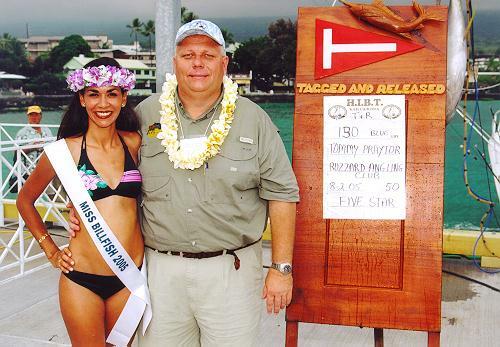 Brad Markham with Miss Billfish with his first ever blue marlin tag. Wade with his frist tag of the week. Tommy even caught one on day 2. Team shot with all 3 tag boards. Wednesday, Day Three of Fishing: We fished with the current HIBT boat leader, the Pamela. We had 2 strikes in the first 30 minutes with Thomas hooking up at 9:00. The blue slapped at the outside rigger and missed. He circled around, knocked down the center rigger and moved off. Thomas started working the bait and the fish came back to him. This time the fight was on with a big jumping display and ripping off a lot of line. Once again the Outdoor Channels cameras were there and they caught everything on tape. While the fight went on the Outdoor Channel had a second boat come into position to get both angles of the fight. The fish made one more run out of the water and the second boat caught it all. Along with the camera on our boat the combination of footage is really spectacular. 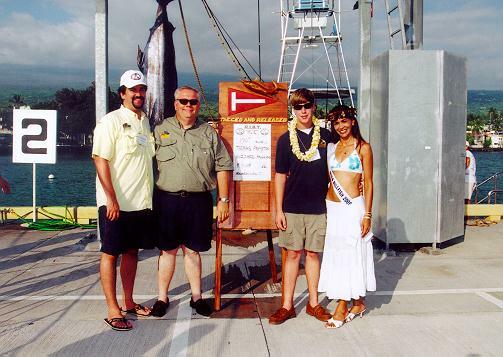 The Captain, Peter Hoogs applied the tag while his son Teddy leadered and billed the fish. The rest of the day was quiet on our side while the Kenyan's caught a 600+ pounder and catapulted them to the lead. We held on to 3rd but after our quick start we were expecting more. Thomas with Miss Billfish and tag #2. Team shot with Tag Board from day 3. Thursday Day Four of fishing: Our morning started very similar to the rest this week with Thomas hooking and catching our first blue marlin before 9:00. The fish slapped at one of the outriggers first, moved off and came back for an inside bait. This blue got airborne from the moment it hit and tail walked straight to the boat. I hit it with a tag and we were on the board early and Thomas had his 3rd fish of the week. The rest of the day was quiet until 3:20, we had just 40 minutes left and it looked like Thomas's fish would be it for the day. 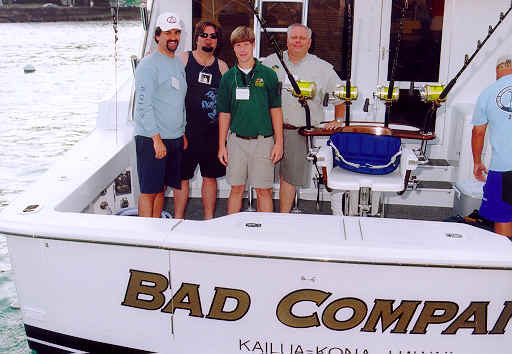 I was on the bridge with Bad Company's Captain Randy Parker and I saw the fish move towards our lines from a sea buoy. Wade Sherman was in the chair and I was letting him know where the fish was she crashed an inside line. The fish jumped and I looked at Randy and we both knew we had a keeper. I guessed 400 and Randy thought 425, the fish was big and like our first fish of the day it appeared to want to come to the boat. We got it to the double line 3 times and on the 3rd time it went screaming for the bottom dumping the line off the 80 wide real. Finally, the fish quit going down and Wade started the long slow process of getting her back to the boat. After an hour and a half the fish came back to the leader and OB sunk the flying gaff to put it on the boat. Once on board the fish was thinner than what we thought but it could still be big points with only 1 other fish being brought to the scales. The first fish weighed 338, Wade's went 342. Those points along with the bonus for big fish of the day put us in second just 43 points off the team from Kenya, with 1 day of fishing left. 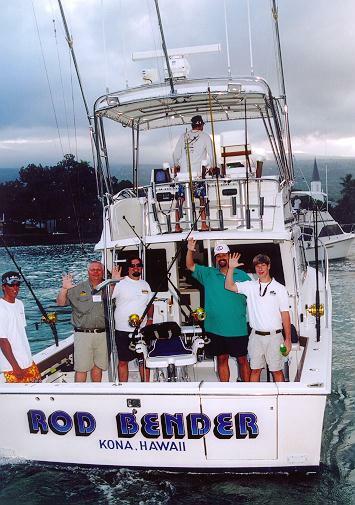 Our final day of fishing will be on the Rod Bender skippered by Chip Van Mols. 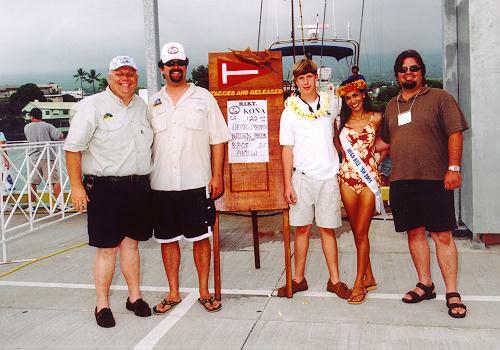 This boat set the World Young Angler Record for Blue Marlin, sounds like it could be right up Thomas's alley. 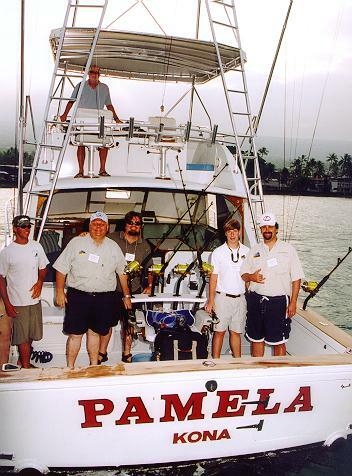 Team shot leaving from Kailua Pier on Randy parker's Bad company 55. Thomas with tag board #3. Wade makes the big score putting us in 2nd with this 342.5 blue. Our biggest day of the tournament. Friday, Final Day of Fishing: Going into the final day of fishing we knew we needed 1 fish to catch the Kenyans and probably 2 to win. Early on the Kenyan's hooked up with a 600 pounder that would have sealed the tournament for them but it pulled the hook. Within minutes we had another weigher in the baits the would win the tournament. She slapped at 2 different baits but we never got her hooked up. That would be our action for the day. Going into the final day the Buzzards and the Kenyans were slugging it out for first and while we were both blanked on day 3 the team from the Bahamas was on a terror. Team Bahama tagged and released 3 fish on Friday that catapulted them from 3rd to 1st while our team settled for 3rd. 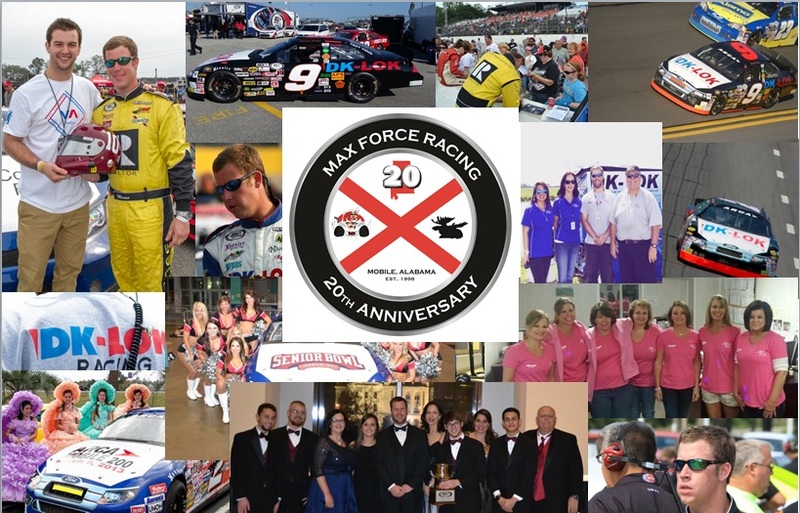 While we were hoping for the top spot, the week was absolutely incredible! We raised over 20 blue marlins, tagged and released 6 billfish and weighed 1 that was the biggest fish of the day. The points we scored were enough to to win this tournament 41 of the 46 years. 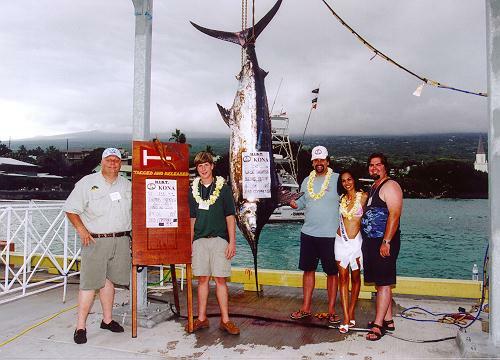 It was an incredible week of fishing in Kona Hawaii. Team shot leaving from Kailua Pier for our final day of fishing. At the awrds banquest at the Fours Seasons.